Every parent with more than one child must be blessed with the wisdom of more than one parenting method. In other words, every kid is different and what works for one will not necessarily work for another. Anyone with me? Such is the case for my #2. The Middle Child. I am learning that she needs a little extra "cheering on"; lots of positive encouragement. Sarah has a little trouble with focusing—I've heard this from each of her teachers and coaches. She isn't being naughty, she just gets distracted in her own little la-la land. She often has to be told several times to do something, which can be frustrating from a parent's (or teacher's) point of view. It is hard not to resort to yelling, but when I get frustrated her behavior only declines. When she gets discouraged, she shuts down. Case in point—we are trying to teach her to ski. She is quite good at it, but only when she wants to be. If she falls once, all of the sudden she is falling all the time. She hates being told what to do to improve her skiing. Since we really want to make it a family activity that we all enjoy doing together, we are really trying to encourage her to love it. So carefully and patiently we follow her down the hill at her pace with lots of praise and cheering on. When she is up she is up! She has a few little quirks as evidence of her anxiety for approval... she tends to chew on things (fingernails, pencils, shirt sleeves) so we have been working on those habits with the advice of an occupational therapist that visits the school. So far she has recommend a stress ball and a bracelet that is safe to chew on. Don't get me wrong. Sarah definitely has talents worth celebrating and encouraging. She is doing well in school, despite her lack of focus. She is good at math and reads very well. She has a contagious smile. She has a beautiful voice and natural musicality. I'm hoping she will overcome her fear of what people think and try out for singing solos in her class programs because she is absolutely capable. We are going to start her with piano lessons soon. Most times she follows in the shadows of her older sister and does the same activities, but Abby (to whom everything comes very easily) can be a tough act to follow. I'm starting to consider ways for Sarah to express her own individuality. Abby became obsessed with gymnastics and wanted so badly to enroll in dance this year. It was expensive, so when Sarah didn't seem passionate about it we decided only to enroll Abby. 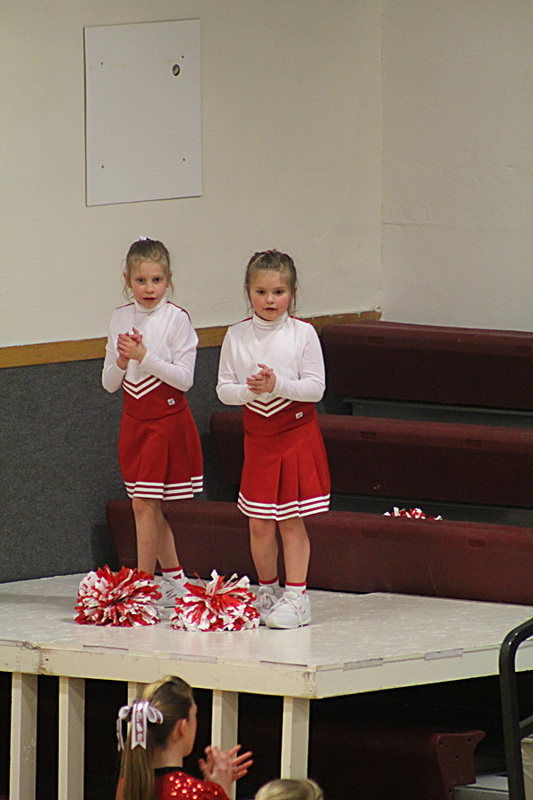 Instead, we found Sarah's opportunity in a little cheerleading program they started offering at the school this year. So we have been cheering on our little cheerleader! They had a performance during half-time of the last Varsity girls basketball game. She did awesome, and she really enjoyed the attention afterwards (flowers from her coach and lots of praise from the crowd and family who came to cheer her on.) It was fun to see her beam. 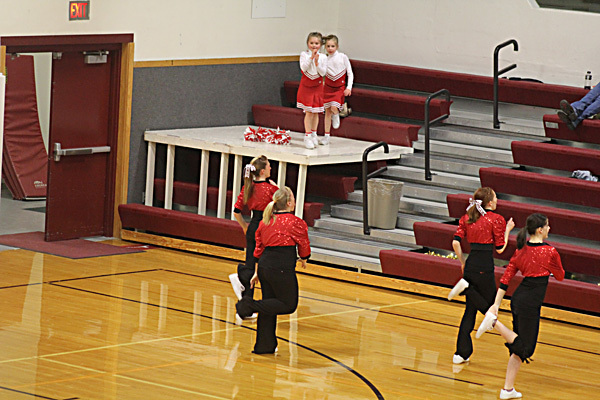 And seriously, what could be cuter than a line of little cheerleaders? 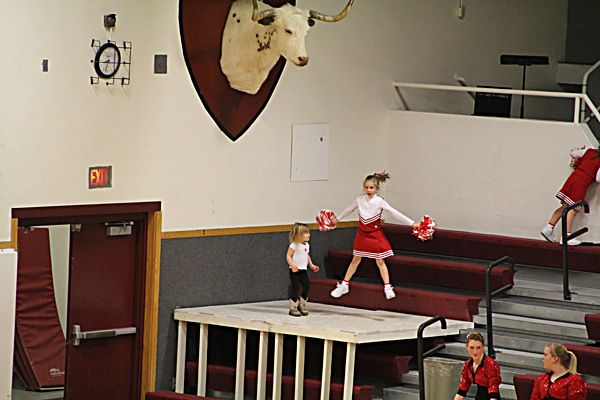 Afterwards, when she thought no one was paying attention to her, she and her friend used the drum platform to practice their skills and mimic the high-school cheerleaders. Of course, everyone was watching her. ;) At least, I was along through my telephoto lens. What a cutie. It was pretty fun to see them all lined up year by year. (All photos are mine except years 2 and 3 which are credited to the aforementioned Casey and Scott). 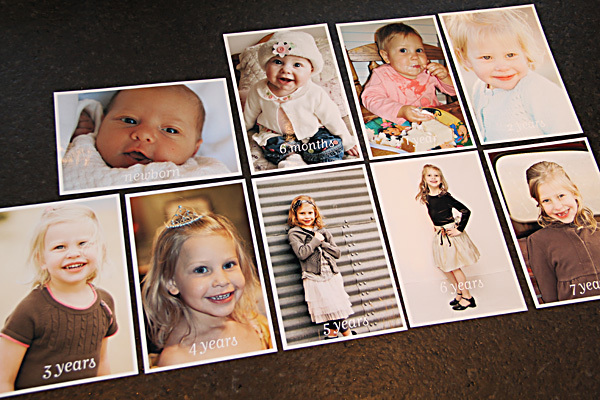 Ages ago I put together a scrapbook of Abby's first year. Its filled with first-baby photos and documents 3 baby showers I was blessed with. Of course I intended to do one for each of my kids, but this is the last scrapbook I've done. (Sad, but true!) Sarah often says to me, "Mom, why don't I have a baby book? You love Abby more than me!" And she loves to point out the pictures of those showers and say "Mom, why didn't I have a shower? No one loves me!" Of course, now that I've given you some background on her behavior, you understand her dramatics. But these photos have reminded me how badly I need to celebrate the life of my sensitive middle daughter and get a book made already. It would mean the world to her. Pride is dangerous but self-worth is invaluable. It is a fine line, isn't it?